Condoleezza Rice says her experience as a professor and administrator at Stanford University shaped her view of affirmative action. WASHINGTON (CNN) -- National Security Adviser Condoleezza Rice -- one of the highest-ranking members of the Bush administration -- said Friday she believes race can sometimes be considered as "one factor among others" to achieve diversity within a school or university. The White House released a rare statement from Rice the same day that a story in "The Washington Post" credited her with taking a key role in helping to shape the Bush administration's decision to challenge the affirmative action admissions policy at the University of Michigan. 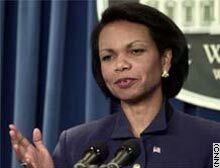 In her statement, Rice, who is African-American, stressed she agreed with Bush's call for diversity and confirmed that the president had asked her views about the matter before filing the friend-of-the-court briefs. But her statement went further than the briefs filed by the Bush administration on one key point -- whether race could ever be considered a factor in considering admissions. "I agree with the president's position, which emphasizes the need for diversity and recognizes the continued legacy of racial prejudice, and the need to fight it," Rice said. "I believe that while race-neutral means are preferable, it is appropriate to use race as one factor among others in achieving a diverse student body," Rice said. In the two briefs filed Thursday with the Supreme Court, the administration, did not specifically address the question of whether race could ever be used as a factor in considering admissions, emphasizing "race-neutral" options. Asked at a briefing whether Bush believed race could be "any factor," White House spokesman Ari Fleischer said Friday that the president decided to file briefs that were "narrowly tailored." "The president did not want to constitutionally proscribe one way or another except for the fact that it cannot and should not, in the president's judgment, be done through the use of quotas," Fleischer said. "I'm glad to see Condoleezza Rice says race should be one of the factors. It should, although that is not what the administration's brief says." Lewis also noted that Secretary of State Colin Powell has in the past publicly praised the benefits of affirmative action, saying it has helped thousands of minority youngsters get an education. "Maybe they ought to continue the debate within the administration," Lewis said. Rice said when the administration decided to file the briefs in the University of Michigan cases, the president asked for her view on how diversity can best be achieved on university campuses. She said the view she offered was based on her experience in academia and as provost of a major university. Rice served as provost at Stanford University from 1993 to 1999. She previously served as a professor of political science there, and she has won two of the university's highest teaching honors.